The Hermeneutical Competence: How to Deal with Faith Issues in a Pluralistic Religious Context? Most of the faith-based schools in the Netherlands are either Protestant or Roman Catholic, although there are some Islamic faith-based schools. These schools operate in a complex system inherited from the typically Dutch ‘pillar system’. 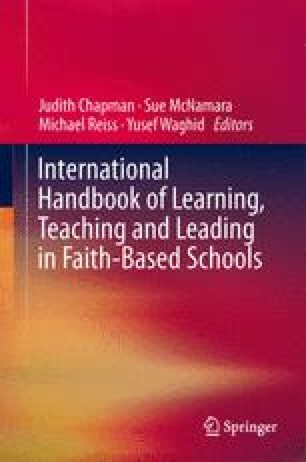 In this chapter, I explore some answers given by specialists in the field of religious education (RE) to the question how RE could contribute to the education of young people who are self-confident citizens in a multicultural, multi-religious society. First, I give a sketch of the Dutch educational system and some of the public debates about this system. Then, I give a brief overview of some trends in the formation of the religious identity of the younger generation; I here focus on young Muslims in the Netherlands. In the Dutch context, RE is sometimes seen as teaching into religion, sometimes as teaching about religion and sometimes as teaching from religion. In the last part of the chapter I focus on the context of schools with a Christian confessional background that struggle with the fact that they have to cater to a much more multi-religious school population. Phalet, K., & Ter Wal, J. (Eds.). (2006). Moslim in Nederland: Diversiteit en Verandering in Religieuze Betrokkenheid. Turken en Marokkanen in Nederland 1998–2002. The Hague: SCP Werkdocument 106b. http://www.scp.nl.